– read the story below. 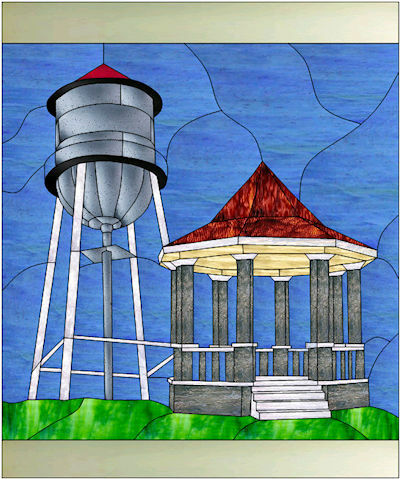 I created and donated the stained glass panel for the 2006 Spring Festival, when we celebrated New Sharon’s 150th Anniversary. Someone once told me they didn’t like to get out of sight of the water tower, which lead me to the band stand, and this was the inspiration for the design. I started work on it in November of 2005 and completed it in February of 2006, just in time for the North Mahaska Farm and Home Show, where it was first showcased. After the show it traveled to many of the businesses downtown; Including Donna’s Cafe, Crow Row Antiques, and Flowers, Etc. It was raffled off during the 2006 Spring Festival program in the park and Kathy Houser won it, later she donated it to the Fire Department. It is currently hanging in the New Sharon Fire Department fire house.